Back in February we wrote about the planned massive tree cutting for the French Broad River in the River Arts District of Asheville. The planned cutting is to make way for people to enjoy new greenways and bike paths and those darn trees are obstructing the view. Here's the Tree Report that was published at that time. We also wrote about the Asheville Tree Commission, whom we learned has no say in City projects such as greenway projects. We learned that the City doesn't even use its own Tree Commission and on board arborists to review the projects. 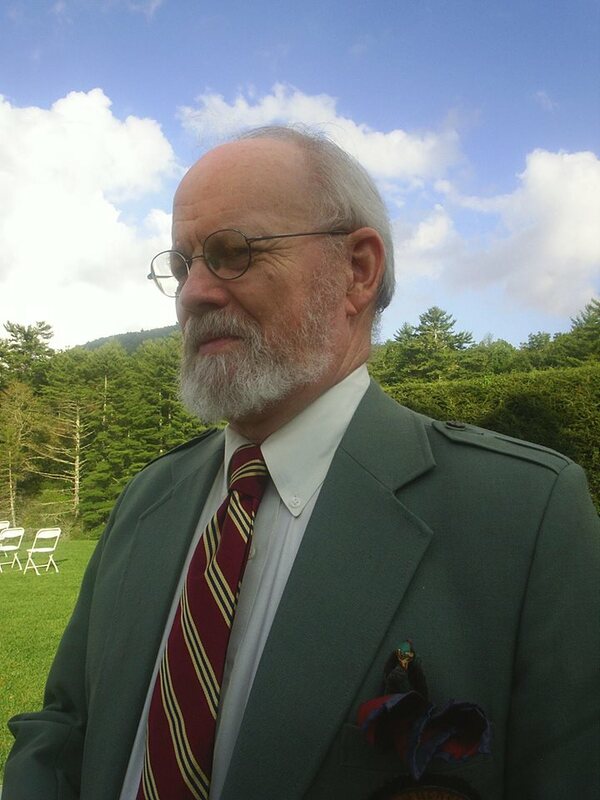 We wrote about it in this article, "Asheville Tree Commission can't see the forest for the trees"
Asheville Unreported's Roger McCredie, recently wrote about the City's own lack of a Tree Ordinance. Click here to read that article. Asheville Unreported: If they won't cover it, we will. So. 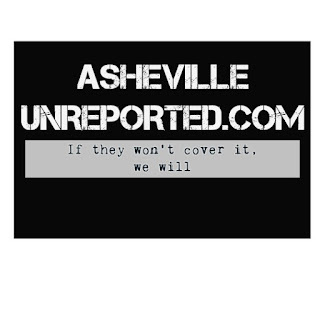 We've extended the scope of our research and investigation from the River to the rest of the City and County and launched www.AshevilleUnreported.com. If they won't cover it, we will. Check it out and sign up. 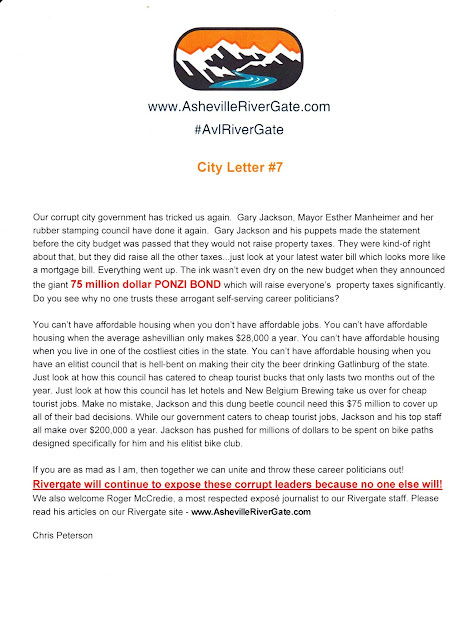 We learned a lot when we dug into the facts about the River Arts District Transportation Improvement Project, aka RADTIP and also known as Asheville River Boondoggle.. But we really learned that this extends far beyond the French Broad River. This project is costing $25 Million to City Taxpayers - 4 years worth of what our Capital Improvement Budget used to be before this crew came in. But now, because they've over run their budget, they need more. The City lied and said it would not increase property taxes this year but a week after passing the budget introduced a $75 Million Bond Referendum that will result in additional $36 MILLION in interest payments alone to taxpayers. These interest payments must be paid for by increasing property taxes. You will see a huge increase in your property taxes AT MINIMUM. If you rent... get ready for a rent increase because landlords will pass these increases on to you. This is on top of other City service rates that were increased - trash, water, stormwater, etc. Probably one. For everything else, a staff of seven. And a $1M budget. 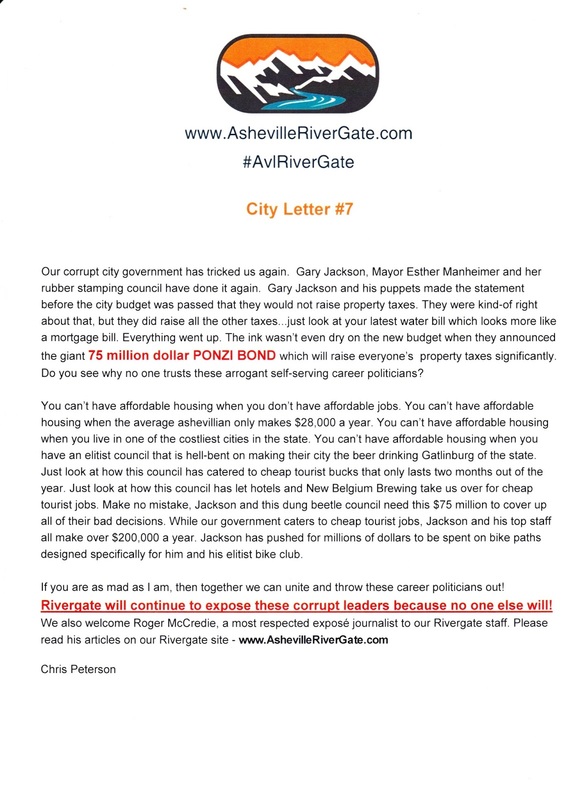 Asheville River Gate obtained comparison figures for city attorneys in several cities of comparable size to Asheville statewide and found that Currin is the highest paid city attorney among those municipalities examined. 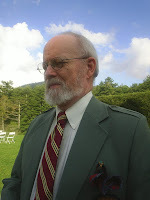 Currin’s annual base salary of $177,700 outstrips those of Fayetteville ($165,185.20), Wilmington ($158,331), Gastonia ($139,502) and Hickory ($102,192). Property owners in the RADTIP area have been receiving their low ball appraisals from the City of Asheville. Artists in buildings have been put on notice to vacate (click here to read more). June 30, 2016 - The City must provide evidence that they can obligate funds and expend such funds by September 30, 2021. Pay attention to this year's budget as this will help provide the proof that they need. September 30, 2016 - According to the memo, this is the most important milestone - the City must have all pre-construction activities completed which includes planning (environmental documentation), design and right-of-way. All right-of-way must be purchased and recorded by this date.